strict warning: Non-static method view::load() should not be called statically in /home/draganos/sf.geekitude.com/sites/all/modules/views/views.module on line 879.
strict warning: Declaration of views_handler_filter::options_validate() should be compatible with views_handler::options_validate($form, &$form_state) in /home/draganos/sf.geekitude.com/sites/all/modules/views/handlers/views_handler_filter.inc on line 589.
strict warning: Declaration of views_handler_filter::options_submit() should be compatible with views_handler::options_submit($form, &$form_state) in /home/draganos/sf.geekitude.com/sites/all/modules/views/handlers/views_handler_filter.inc on line 589.
strict warning: Declaration of views_plugin_style_default::options() should be compatible with views_object::options() in /home/draganos/sf.geekitude.com/sites/all/modules/views/plugins/views_plugin_style_default.inc on line 25.
strict warning: Declaration of views_plugin_row::options_validate() should be compatible with views_plugin::options_validate(&$form, &$form_state) in /home/draganos/sf.geekitude.com/sites/all/modules/views/plugins/views_plugin_row.inc on line 135.
strict warning: Declaration of views_plugin_row::options_submit() should be compatible with views_plugin::options_submit(&$form, &$form_state) in /home/draganos/sf.geekitude.com/sites/all/modules/views/plugins/views_plugin_row.inc on line 135. 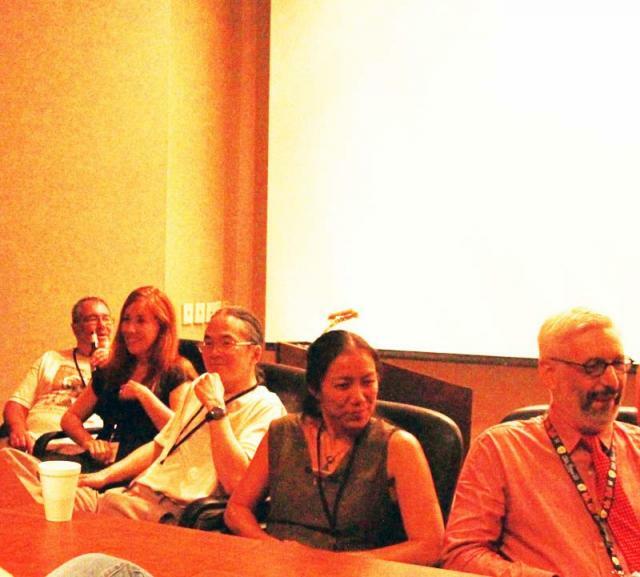 At ArmadilloCon 2014, Jayme Lynn Blaschke interviewed Ted Chiang, one of the two writer Guests of Honor. Here are some topics they talked about: linguistics, Sapir-Whorf hypothesis and "The Story of Your Life", the possibility of it being turned into the movie -- this was 2 years before the story got turned into the movie "Arrival"; is Ted Chiang's fiction influenced by the environment; writing the ending first, his story length, and whether he is going to expand "Liking What You See" into a longer story; does he ever plan to write a novel; the first stories he wrote as a teen; who were his influences; and what appeal does he find in discredited scientific theories, such as preformation (on which his story "72 Letters" is based). Jayme Lynn Blaschke. Question that's on everyone's mind: what is it like to be a Hollywood bigshot now? Ted Chiang considers himself a furthest thing from a Hollywood bigshot. Until the cameras start rolling, there is no guarantee that the movie will get made: many movies had been canceled at the last minute. He hasn't been very involved in making the movie, short of looking at the finished screenplay. While he thought the screenplay turned out very well, he doesn't think his approval or disapproval of it would have mattered. The rest of the interview revolved around Ted Chiang's writing process. Jayme Lynn Blaschke. "The Story of Your Life" has two languages, Heptapod A and Heptapod B. It was your take on Sapir-Whorf hypothesis where language determined the perception of the world. Did you spend months working out the nuances of those languages? Because this is a pretty unique take on languages. Original inspiration for the story was not about linguistics. Originally I wanted to write a story about someone who knew the future, but was unable to change it. What sort of emotions that person might experience, knowing that both good things and bad things were going to happen, and not able to do anything about it? I had to figure out how to grant this protagonist ability to know the future. I toyed with a couple of possibilities: through meditative experience, through mind-altering drugs, some other experimental treatments? None of those seemed particularly interesting to me. Then I remembered Sapir-Whorf hypothesis. Learning a language and then being able to know the future -- that seemed a very interesting idea to me. It was only then that it became a story about linguistics. At that time I didn't know a whole lot about linguistics, and I realized it was going to be a very difficult story to write. I thought I wasn't a good enough writer to write this story. I spent the next few years reading books about linguistics and working on my writing, and then finally I felt I knew enough about linguistics to fake it, and I was going to give it a try. Jayme Lynn Blaschke. Do you have nuggets of stories that feel like they are too big for you to handle, but you might be ready for them in the future? Not at the moment. Back then I had a pretty clear idea of what I wanted that story to do, and I knew it was going to be ambitious. I haven't had the same experience since then. Jayme Lynn Blaschke. You are originally from New York, but currently live in Seattle. Does environment influence you any way? Ted Chiang doesn't think so. He has, however, visited some interesting places. Beside Japan, which felt very futuristic, he had a lot of good to say about Iceland. Iceland is either a science-fictional or a fantasy landscape made real. There are fields of volcanic rock that are covered in 6 inches of moss. So you are walking through a field of gigantic green throw-pillows stacked up, and you expect a troll, a fairy, or a hobbit to poke his head up. There are also those fields of bare volcanic rock, and outdoor hotsprings with steam billowing off the thermally heated water, and I wouldn't be surprised if a viking ship came out of the fog - it is a very cool place. An audience member. I just would love to hear about your process. When an idea keeps coming back to me over a period of months or years, clearly there's something about it that speaks to me. I try and spin up story scenarios based on that idea. When I find a scenario that's more interesting, I think about it more specifically. Then I need to come up with an ending, some conclusion to a story. Once I have it, I'm ready to start writing. Usually the first thing I write is either the very ending of the story, or a paragraph close to the end, and it becomes a destination in my mind. Then I start writing the rest of the story. Usually it's not in any order, not front-to-back, just scenes in random order, whatever seems interesting to me at the time. I stitch them up in a way that will make them continuous, and that's a story. I used to start writing stories when I didn't know how they would end. Most of the time I didn't finish those stories. I decided that's not a good way for me to go. For many writers it works well when they don't know how it ends, but not for me. So now I don't start a story unless I know how it ends. He adds later in the interview that a lot of times you see in movies and novels that a writer has painted himself into a corner, because they didn't plan ahead. The story got away from them because they didn't clearly plan out their destination, or how they were going to get there. Starting at the ending avoids that problem. Jayme Lynn Blaschke brings up another Ted Chiang story, "Liking What You See", for which he turned down a Hugo nomination in 2003 because it was rushed. Jayme asked if Ted Chiang had plans to rewrite it and make it the length he originally planned. Ted Chiang. With "Liking What You See", I'm quite content with it as it exists. It just that originally I had a longer story in mind. I asked for a deadline extension but still couldn't get it. So I had to alter my conception. Jayme Lynn Blaschke. So we can't expect you to pull a Michael Moorcock and expand "Behold The Man" into a novel? Or pull a Greg Bear and expand "Blood Music" in to a novel? Ted Chiang said that he never attempted to expand his previous works, because each story's length was what it needed to express its idea. Ted Chiang (left) and Jayme Lynn Blaschke. 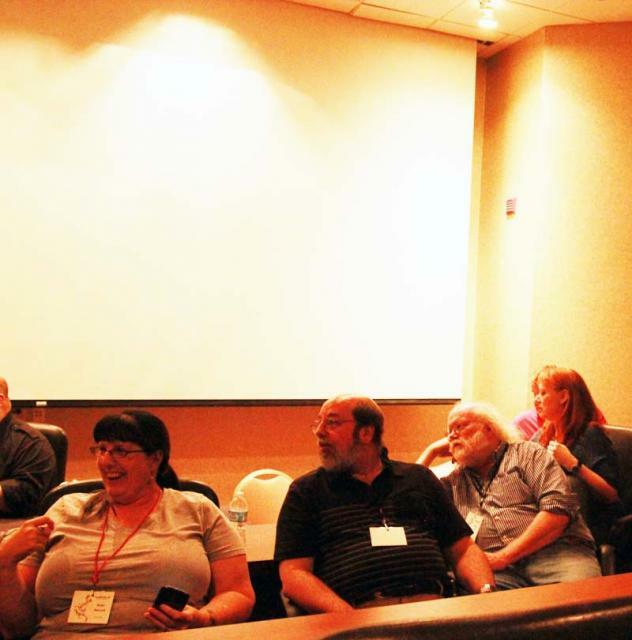 More pictures from ArmadilloCon 2014 are in my photo gallery. Jayme Lynn Blaschke asked about Ted Chiang's first stories, which he started writing as a teen. Chiang didn't reveal the name of his first creation, but said it was an attempt at a disaster story in space. As a teen, he wrote adventure -- science-based adventure. It involved research the wavelength of gamma ray emitted when electrons collided with positrons. In other words, as Jayme pointed out, he was writing for Analog. An audience member. Who were the names that helped your transition from adventure stories to more philosophical ones? Ted Chiang. I started reading John Crowley, Gene Wolf, and Ed Bryant. I said this before, but it's worth repeating. A lot of people may have forgotten Ed Bryant, but he won a couple of Nebula awards back in the early 80s. Of the writers I mentioned, the influence of Ed Bryant work on me is the clearest. You can actually see some similarities between his work and mine. I highly recommend collection of Ed Bryant stories "Particle Theory". He deserves to be better known. He switched into horror, and people forgot that he was significant writer of SF short stories in the early 80s. He opened my eyes to the ways you could use science as a metaphor for human experience. Science fiction is not about the futuristic setting, not about the props or the tropes, it's a way of using science to illuminate human experience. An audience member mentions Ted Chiang's story "72 Letters" which she read in college and was so deeply affected by it that she kept obsessing and thinking about it, even walking into the walls. This story is set in a world where an obsolete notion of preformation, meaning that all living beings contain microscopic, but fully-formed versions of their future children, is real. Jayme Lynn Blaschke followed up on that observation, asking Ted Chiang about the appeal of obsolete, discredited scientific theories as story potential. There were good reasons why people believed in those ideas. They were not self-evidently false: it required some experimental results for htem to be discredited. There was nothing patently absurd about those ideas. So with some imagination you could imagine a universe where they were true. It's a matter of what experiment disproves that theory and forces a different one to be proposed. I am also interested in what are the things we take for granted now, not knowing that they are based on an incorrect scientific theory? As far as preformation goes, a human being or any organism is incredibly complicated. Could it come from a single cell, from something completely featureless, like an ovum? How could it give rise for something so complex? The process of fertilized ovum becoming an organism is very complicated, and we are still hammering out its details even now. So a theory that we are fully formed on a scale too small to see is not unreasonable. At least not by itself. What are its implications? If you follow the implications further, then you'll start running into some problems. What did Adam and Eve's sperm and ova look like? Did they contain the whole human race in them? Is it logical, is it plausible? Maybe not so much, but the initial premise isn't obviously absurd. This in general is true about a lot of outdated scientific theories. They could have been true, but they have implications about a different type of universe. What are those implications? What would our view of the world be if it had gone a different way? An audience member. In a time when books are getting bigger and bigger, and writers feel obligated to write trilogies, I very much appreciate how you resurrected a short story and a novella. Ted Chiang. I can't say I resurrected a short story -- it is pretty indisputable that short story is not in great health as a commercial form -- but I'm glad. A lot of people say they expect a short story to make a comeback now that people are reading in short bursts on their electronic devices; but there's not evidence of that in the market. Short stories are very much a minority taste. But that's what I'm comfortable with, that's what I'll continue to write, so I'm glad there are people like you who enjoy it. An audience member. In the "Merchant at Alchemist Gate", we can't change the past, we can only understand it more fully; but knowing now that you write endings first, is it also a metaphor for your creative process? Ted Chiang never thought about it that way, but wouldn't argue if someone proposed it as an interpretation of that story. But the story primarily was about how we deal with our past. In general time travel stories are about regret: how do we cope with the mistakes we've made, or things we wish had turned out differently? (Not counting time travel stories that are about getting to an interesting setting, like dinosaurs.) So Merchant at Alchemist Gate is about accepting your past. An audience member. You're the only writer I know who can accomplish in a short story what takes other people a novel to accomplish not very well. Have you ever considered writing a novel? Ted Chiang. I'm not opposed to it, but I feel the ideas I get are best suitable for short stories. If I got an idea that was suitable for novel length, I would try to write it. But so far I haven't got an idea that requires that much length. 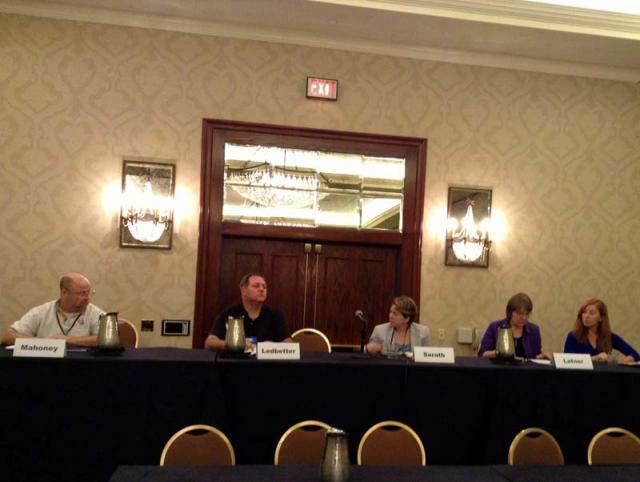 The organizers inteded this panel for discussing what specific people should be on the first team sent to Mars; presumably those would be people we all have heard of, otherwise how could we have a meaningful discussion? But the moderator Patrice Sarath thought this approach would be unproductive. She suggested instead that we talk about what mix of skills we would need to take. Yes, the usual -- doctors and engineers, and enough duplication of skills, so that the expedition would not be doomed if one of the experts die. But then we got into discussion what is more important to take: specialists or generalists? (Assuming that we can't take plenty of both.) An audience member argued that if you needed specific scientific advice, the Earth with its expertise would be just a 20-minute time lag away. So it's more important to take jacks of all trades that have a strong enough understanding of anything mechanical, can work with their hands and fix anything. Sigrid Close, a professor in the Department of Aeronautics and Astronautics at Stanford University, said she had those kinds of graduate students in her lab. Some of them could construct or fix equipment for launching into space out of materials bought at Target, or just literally from stuff laying around on the table. Donald Rumsfeld's famous phrase about "known unknowns and unknown unknowns" was floated here, and with both kinds of unknowns such people would be truly indispensable. Sigrid Close also expressed her admiration for science fiction writers, as they inspire scientists every day. Oh, and she says she still doesn't have a sufficient answer for the question she gets asked a lot: why do we want to send humans into space? Perhaps she doesn't think that "for humanity's survival" is a good enough answer. But the audience protested that one doesn't need any other reason for going into space than because it's there. Bob Mahoney says we do these things because we like to be entertained, and achieving difficult goals is entertaining to humans. Aside from mixture of skills, the panelists discussed what else should we have a mixture of -- perhaps genetic diversity? A mixture of genes to guarantee survival of a colony? Some say such a group should have at least 2000 people. Others pointed out that we can bring frozen eggs or embryos, so gene diversity need not affect decisions regarding what mix of people to bring. Also, there are completely different considerations going into how much and what kind of people to bring if you are just sending the first wave of colonists, with a plan for subsequent waves to come later. Sigrid Close (a professor in the Department of Aeronautics and Astronautics at Stanford University and ArmadilloCon 2014 science Guest of Honor), Patrice Sarath (SF/F author), Ada Palmer (historian and SF/F author), and Ted Chiang (SF/F author) at the Remembering The Future panel panel. 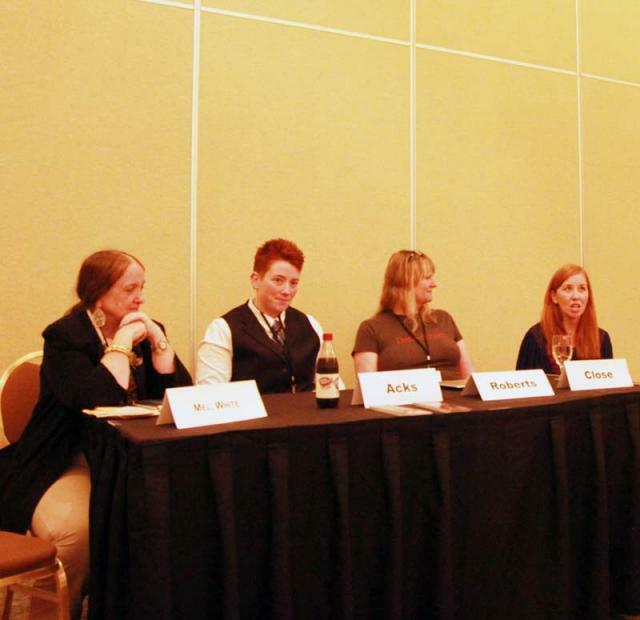 The panel explored the question, is time real or an illusion? Two people in it, Sigrid Close and Ted Chiang, came from science backgrounds, whereas the other two panelists had liberal arts backgrounds. In my opinion, the whole panel illustrated a miscommunication between science in humanities regarding whether a metaphor could be considered "real". 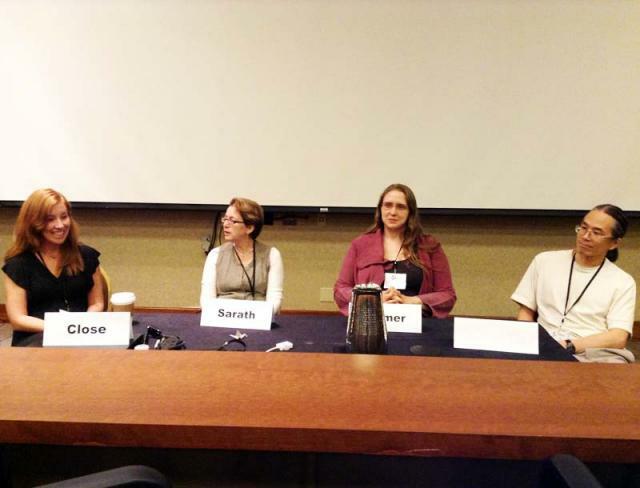 at the "Mathematics, magic, and mystery panel". The panel started out with a discussion of a book by the same name that explored mathematical "paradoxes". Many of them were pretty simple and not paradoxical at all -- for example, the trick where you divide a right triangle into squares, and reshuffle them to make an empty square, thus making a part of the triangle's area to "disappear". 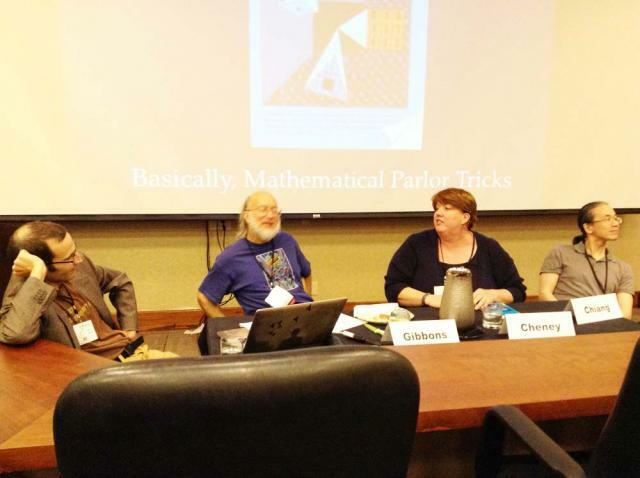 While true mathematical paradoxes can be interesting to explore and could serve as science fiction story material, they would probably require too much advanced mathematical knowledge than an average science fiction reader has; thus, they weren't the focus of this panel. I have to say I didn't understand what role these tricks were supposed to play in this panel. Fantasia Mathematica -- a compilation of math-inspired stories by various authors, 3 of them are about Mobius strip. It also contains poetry and other oddities. Margaret Ball "Mathemagics", which started out as a short story and later became a novel. To be a wizard you have to be a very good mathematician. A story (title unknown) in Greg Egan's collection Luminous there is a story about aliens in a different universe with different mathematics that intersects with ours in "computationally remote areas of the universe". 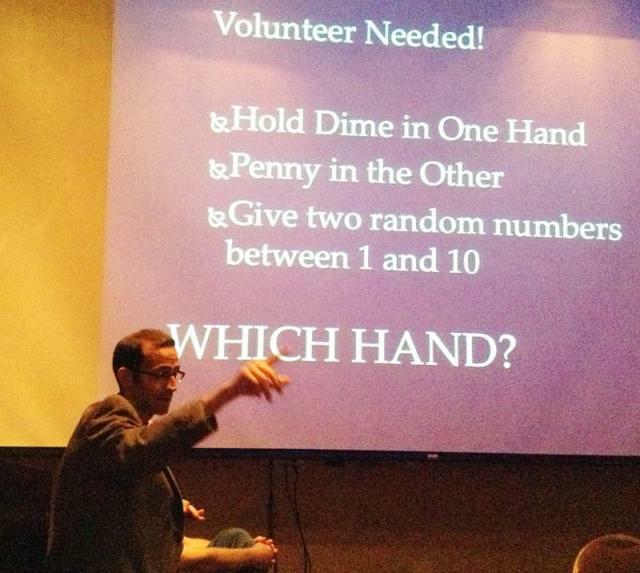 Fannish Feud is an old ArmadilloCon tradition, but it was only this year that I decided to check it out. The rules are not explained to the audience beforehand, so you are left to guess. There are two teams, pros and fans. The person who conducts the game gives one team a question, for example, "A show on Syfy channel". I was puzzled -- does he want the players to guess what show he is thinking about? (See above, rules not explained.) Turns out, no -- he wanted each player to name ANY show on SyFy channel. I would not expect myself to name any show, because I don't follow pop culture, but even some of the players (who, presumably, are well-versed in it), named shows that weren't on SyFy channel. The number of correct answers from each team is written down, and then the conductor gives the next question. There might be some variations and special cases in the rules that let teams score more points, but I stopped following it early on, so I don't know. My ears perked up briefly when I heard a question from Lord of the Rings, but that was it. I will go back to being oblivious to this trivia show in the years to come. They talked about discouragement, both subtle and overt, that women in science and engineering fields have experienced historically and still experience. The panelists and the audience had plenty of personal stories to tell in that regard. They also talked about what is needed to change that at both ends of the pipeline -- from childhood to mid-career women scientists and engineers. A blog post is coming.